Today marks the start of a new multi-part series on poverty and academic performance. I expect to post two or three new parts most weeks in the coming months (there will be at least 20 parts). As I explained last week, the goal of the series is to start to figure out exactly what it is about living in poverty that so dramatically affects students' achievement and attainment and to explore possible policy interventions that could mitigate poverty's impacts. Almost twenty years ago, researchers first focused on a large (as much as one standard deviation) gap between Black and White students, which they termed the "Black-White Test Score Gap" (Jencks and Phillips, 1998). The consensus term soon became “achievement gap” (Meyers, 2012), which has been used more widely to refer to both the gaps in achievement and attainment between different races and ethnicities and between those of different classes or socioeconomic backgrounds (Murphy, 2009). This series will focus on the gaps between different classes. I'll also explore "academic performance" broadly defined rather than just test scores. Academic performance differs widely between students of different social classes across a long list of indicators, including (but not limited to): standardized test scores, grades, graduation rates, college entrance exams, college matriculation, college graduation, and completion of a graduate degree (Meyers, 2009). Though I'll be focusing on the gaps between classes, it's worth nothing that while the Black-White test-score gap narrowed steadily during the 1970s and 1980s . . . but that progress has essentially stalled during the past quarter-century. Why? Potential explanations include changes in families (Berends, Lucas, and Peñaloza, 2008), the re-segregation of schools (Condron, 2009) and/or a myriad of other factors (Covay, 2010). Neal (2005) argues that we do not really know why progress stalled, but notes that most of the narrowing during the previous two decades occurred because of gains by Blacks in the middle and at the top of the distribution while those at the bottom largely remained at the same level. The timing of the halt in progress corresponds roughly with both the reversal of the desegregation movement over the past 40 years (Berends and Penaloza, 2010; Vigdor and Ludwig, 2008) and with widening economic inequality between both Blacks and Whites and rich and poor (Magnuson and Waldfogel, 2008; Mayer, 2001). Given the recent growth in wealth and income inequality, perhaps it should not surprise us that recent evidence indicates that socioeconomic gaps have actually widened during that time. Reardon (2011) finds that the test-score gap between students from high- and low-income families (90th vs. 10th percentile) has grown by 30-40% over the past 25 years and is now approximately twice as large as the black-white achievement gap, the opposite of 50 years ago (see first image below). 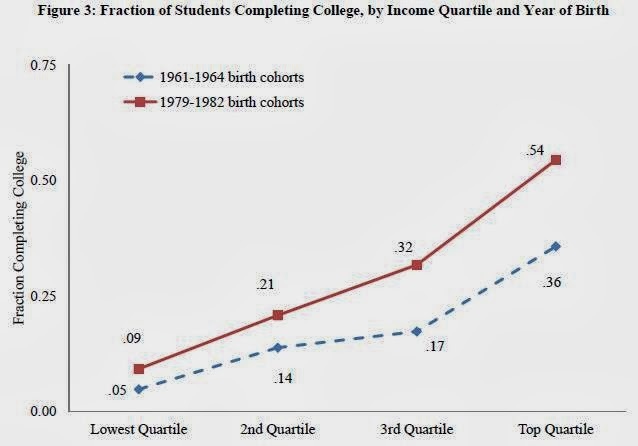 In a working paper, Bailey and Dynarski (2011) find that the gap in college completion between students from families in the top and bottom income quartile grew by 14 percentage points between children born in the early 1960s and around 1980 (see second image below). And another current working paper finds that the gap in educational attainment between children from high- and low-income households grew by a full half-year between the 1954 and 1987 birth cohorts (Duncan, Kalil, and Ziol-Guest, 2013 -- see third image below). The stalling out of progress on the Black-White achievement gap and growth in gaps between classes signals massive problems with our current efforts. But what else could we do? Before we can decide what to change, we need to understand why these gaps exist in the first place. While study after study finds that family income (see, for example: Blau, 1999; Duncan, Brooks-Gunn, and Klebanov, 1994; Sirin, 2005) and wealth are significant predictors of academic achievement (see, for example: Orr, 2003; Shanks, 2007; Yeung and Conley, 2008), the causes of these differences are less clear. What is clear, however, is that these differences in achievement are driven largely by differences outside of school. Consensus on this point has grown since the “Coleman Report” (Coleman et al., 1966) found that non-school factors are stronger predictors of the achievement of a given student than in-school factors, a finding that has been replicated countless times over the past forty plus years (see, for example: Alexander, Riordan, Fennessey, and Pallas, 1982; Hauser, 1972; Sirin, 2005). The current consensus is that home background factors predict about two-thirds of achievement and school factors predict about one-third (Rothstein, 2004). Indeed, if there is anything upon which education researchers agree it is that student achievement is influenced more by non-school factors than in-school factors – and the evidence is overwhelming. The relative importance of non-school factors can be seen early on; when students begin school, a large gap in achievement already exists (Lee and Burkam, 2002). Racial gaps are non-existent in infants, but observable in toddlers (Fryer and Levitt, 2013), so the causes are almost certainly environmental rather than genetic. Not only is the achievement gap present when students begin school, it grows during summer breaks (Borman and Benson, 2010; Downey, von Hippel, and Broh, 2004; Entwisle and Alexander, 1992; Heyns, 1978). The growing gap between high- and low-SES kids during summer months eventually results in high schoolers who are more likely to be assigned to different tracks despite similar ability earlier in life and decreases the odds of low-SES students both graduating from high school and enrolling in four-year colleges (Alexander, Entwisle, and Olson, 2007). Given that the gap forms before school and widens during breaks from school, our best estimate is that about three-quarters of the gap is formed outside of school and about one-quarter is formed while students are in school (Murphy, 2009). This makes sense when we consider that kids spend only about 14-15% of their waking hours actually inside of schools from birth through high school*. If we know that achievement gaps form before school and widen during summers, the next thing we need to know is how students' lives differ during these times. And which of these differences affect academic performance? In the next parts, I'll explore why differences in housing and neighborhoods, health and health care, and family and home environment exist, assess the evidence that they affect academic performance, review the theory as to why they would affect academic performance, and discuss the potential of policy to address the problem. *If a student spends 7 hours per day in school and attends 180 days of school for 13 years, they spend 16,380 total hours in school. Assuming 16 waking hours per day for 18.5 years, the average child would spend 108,114 hours awake from birth through high school. 16,380/108,114 = 15.15%. A more realistic estimate is probably to assume that students attend 12.5 years of school on average for 6.5 hours/day 170 days per year, but sleep 9 hours per day, which would yield an estimate of 13.97%. Some students would spend far more time in school if they sleep longer hours and/or attend schools with longer days/years, while others would spend far fewer hours if they sleep less, attend school less regularly, and/or drop out of school before graduating. Alexander, K. L., Entwisle, D. R., and Olson, L. S. (2007). Lasting Consequences of the Summer Learning Gap. American Sociological Review, 72, 167-180. Alexander, K. L., Riordan, C., Fennessey, J., and Pallas, A. M. (1982). Social Background, Academic Resources, and College Graduation: Recent Evidence from the National Longitudinal Survey. American Journal of Education, 90(4), 315-333. Berends, M., and Penaloza, R. V. (2010). Increasing Racial Isolation and Test Score Gaps in Mathematics: A 30-Year Perspective. Teachers College Record, 112(4), 978-1007. Borman, G., and Benson, J. (2010). Family, Neighborhood, and School Settings Across Seasons: When Do Socioeconomic Context and Racial Composition Matter for the Reading Achievement Growth of Young Children? The Teachers College Record, 112(5), 5-6. Coleman, J. S., Campbell, E. Q., Hobson, C. J., McPartland, F., Mood, A. M., Weinfeld, F. D., and York, R. L. (1966). The Equality of Educational Opportunity Report. Washington, D.C.: U.S. Government Printing Office. Covay, E. A. (2010). 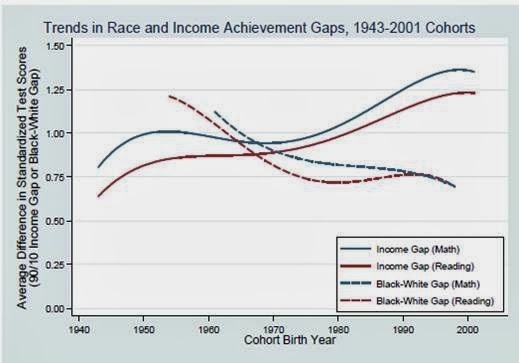 The Emergence and Persistence of the Black-White Achievement Gap. (Doctoral Thesis), University of Notre Dame. Downey, D. B., von Hippel, P. T., and Broh, B. A. (2004). Are schools the great equalizer? Cognitive inequality during the summer months and the school year. American Sociological Review, 69, 613 - 635. Duncan, G. J., Brooks-Gunn, J., and Klebanov, P. K. (1994). Economic Deprivation and Early Childhood Development. Child Development, 65(2), 296-318. Entwisle, D. R., and Alexander, K. L. (1992). Summer Setback: Race, Poverty, School Composition, and Mathematics Achievement in the First Two Years of School. American Sociological Review, 57(1), 72-84. Hauser, R. M. (1972). Socioeconomic Background and Educational Performance. Washington, D.C.: American Sociological Association. Heyns, B. (1978). Summer learning and the effects of schooling. New York: Academic Press. Jencks, C., and Phillips, M. (1998). The Black-White Test Score Gap: An Introduction. In C. Jencks and M. Phillips (Eds. ), The Black-White Test Score Gap (pp. 1-51). Washington, DC: The Brookings Institute Press. Lee, V. E., and Burkam, D. T. (2002). Inequality at the starting gate. Washington, DC: Economic Policy Institute. Magnuson, K., and Waldfogel, J. (2008). Steady Gains and Stalled Progress: Inequality and the Black-White Test Score Gap: Russell Sage Foundation. Mayer, S. E. (2001). How Did the Increase in Economic Inequality between 1970 and 1990 Affect Children's Educational Attainment? American Journal of Sociology, 107(1), 1-32. Meyers, C. V. (2009). Tracking the Gaps. In J. Murphy (Ed. ), The Educator's Handbook for Understanding and Closing Achievement Gaps. Thousand Oaks, CA: Corwin Press. Murphy, J. (2009). The Educator's Handbook for Understanding and Closing Achievement Gaps. Thousand Oaks, CA: Corwin Press. Neal, D. (2005). Why Has Black-White Skill Convergence Stopped? National Bureau of Economic Research Working Paper Series, No. 11090. Orr, A. J. (2003). Black-White Differences in Achievement: The Importance of Wealth. Sociology of Education, 76(4), 281-304. Reardon, S. F. (2011). The Widening Academic Achievement Gap between the Rich and the Poor: New Evidence and Possible Explanations. In R. Murnane and G. Duncan (Eds. ), Whither Opportunity? Rising Inequality and the Uncertain Life Chances of Low-Income Children (pp. 91-115). New York: Russell Sage Foundation. Rothstein, R. (2004). Class and schools: Economic Policy Institute Washington, DC. Shanks, T. R. W. (2007). The impacts of household wealth on child development. Journal of Poverty, 11(2), 93-116. Sirin, S. R. (2005). Socioeconomic Status and Academic Achievement: A Meta-Analytic Review of Research. Review of Educational Research, 75(3), 417-453. Vigdor, J. L., and Ludwig, J. (2008). Segregation and the Test Score Gap. In K. Magnuson and J. Waldfogel (Eds. ), Steady Gains and Stalled Progress: Inequality and the Black-White Test Score Gap (pp. 181-211). New York: Russell Sage Foundation. "Racial gaps are non-existent in infants, but observable in toddlers (Fryer and Levitt, 2013), so the causes are almost certainly environmental rather than genetic." This is very flimsy evidence against a role for genetic differences. The measures of infant cognitive ability (Bayley scales etc) are very unreliable and the relative role of genetic factors increases greatly as the child matures into adolescence and adulthood. The "achievement gaps" are very likely to be manifestations of the ethnoracial group differences and the social class differences in IQ (general cognitive ability). Before you dismiss the role of genetics and IQ in individual and social class variation in performance on standardized test scores you should carefully read the works of hereditarian scholars such as Robert Plomin, Ian Deary, Dorret Boomsma, Matt McGue, John DeFries, and Nick Martin. Before you dismiss the role of genetics and IQ in ethnoracial group variation in performance on standardized test scores you should carefully read the works of hereditarian scholars such as Hans Eysenck, Arthur Jensen, Phil Rushton, Richard Lynn, Linda Gottfredson, Richard Herrnstein, Sandra Scarr, Heiner Rindermann, David C. Rowe and Brian Pesta. Currently there are two large efforts to utilize genomic sequencing technology to discover the gene allele differences that cause human variation in IQ. One project is led by Steve Hsu (he is VP for research at Michigan State Univ but the IQ gene project is mostly occurring at the Chinese genomic research institute known as the "BGI") and the other research project is led by Jonathan Rothman (inventor of the Ion Torrent genomic sequencing machine). The ethnoracial group differences in genome alleles are all already cataloged in various public databases (e.g. see the HapMap databank). ...the other research project is led by Jonathan ROTHBERG (inventor of the Ion Torrent genomic sequencing machine). The ethnoracial group differences in genome alleles are all already cataloged in various public databases (e.g. see the HapMap databank). Nice start -- looking forward to the next one! Thats one of a great post I read after a long time. Poverty is like a disease.